Fish stories usually have one common thread between them: exaggeration. Most of us have been guilty of adding a pound or two to our catch or stretching our arms a little farther apart than we know the fish actually was. However, with social media instantly connecting us with other anglers and their fish, photographic evidence of some unbelievable fish being caught is rolling in. 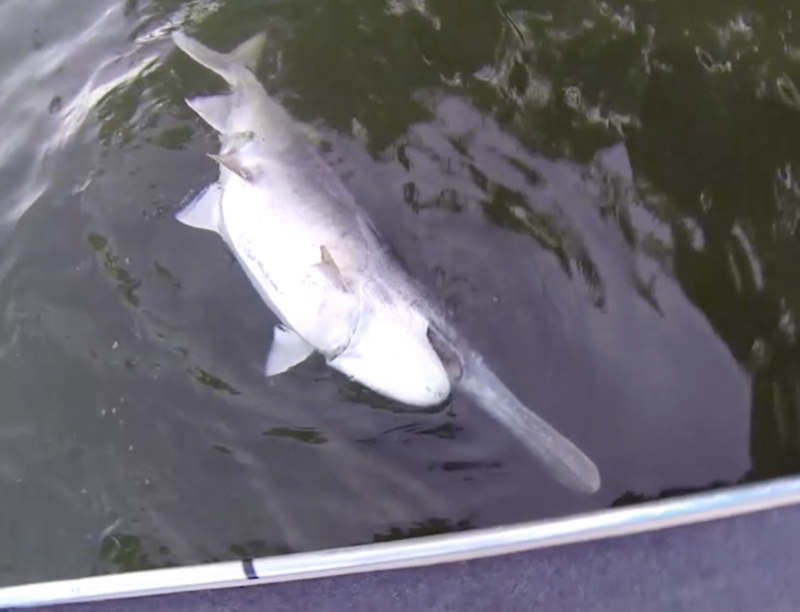 Here are three quick, unbelievable fishing stories from Missouri. 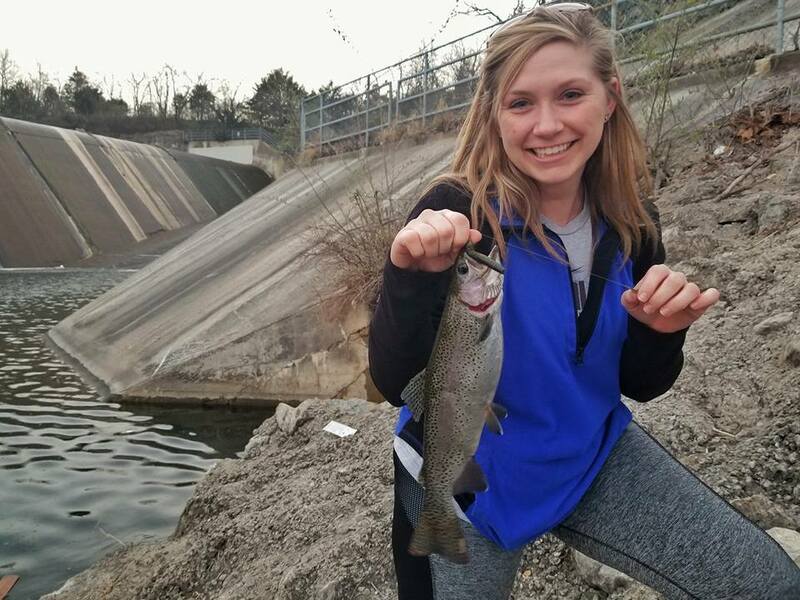 While Tyler Mahoney and his girlfriend, Sami Thomas, fished the spillway in early spring, they were expecting to catch a few bass and maybe a crappie or two. So when Sami reeled in a rainbow trout, they were a bit surprised. Trout were never stocked in the spillway or Prairie Lee, the lake that feeds into it. Aside from this fact, rainbow trout need cold running water to survive. So how did it end up in there? The best explanation is that it was caught out of one of James A. Reed’s trout ponds and dumped in the spillway. 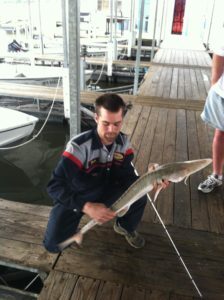 Most people have never seen a sturgeon let alone caught one. However, a lucky dock fisherman at Longview Lake had a rare encounter with one while crappie fishing. Catching the rare fish is only the beginning of this story. The amazing part is that sturgeon were never stocked. After viewing the photo, Jake Allman, the biologist for Longview, concluded it was most likely a Pallid Sturgeon, which are native to the Missouri river. Our best guess is this sturgeon swam from the Missouri river up the Little Blue River and held in the small stream while the dam was built and Longview lake was created thirty plus years ago. It is simply amazing that this fish, which is estimated to be fifty to one hundred years old, made such a long journey and survived. The amount of change this sturgeon had to adapt to during its journey to a new environment is hard to imagine. Couple all that with the fact that Longview is a heavily fished lake and I think you have the perfect recipe for an unbelievable fishing story. Fishing, Lee's Summit Area Fishing, Mahoney Outdoors, Payden Hays, Unbelievable Fishing Stories. Bookmark.